NEW Tune and Play Along! Dave has teamed up with the world-class pianist/keyboardist Oz Ezzeldin on "Dis Kinda Place." 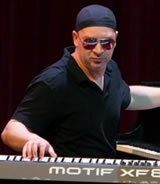 It's a high-energy fusion-funk tune available as a play along for drummers, keyboard players, or bass players. It comes with play along mixes (with and without click) and a chart. A full video of Dave's session is below! Click here to purchase a play along package for just $4.99! Or, join Dave's Online School where this package includes an 80 minute lesson, a 35 minute discussion between Dave and Oz, and 25 hours of drumming curriculum, interviews, live footage, and more! It also includes entrance into Dave's private Facebook group, where he checks in every day to watch your videos and answer question! Click here to see the tour page! 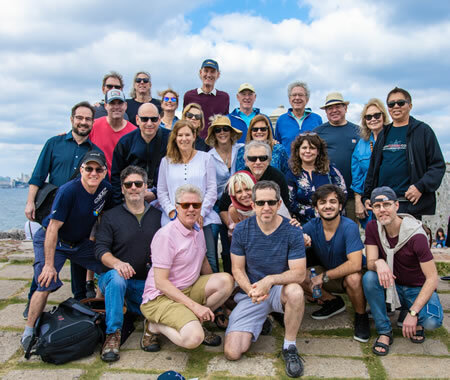 Dave completed an incredible trip to Havana that took place January 13-18, 2019! The trip was a "musical exchange" where Dave and a small group of travelers met and listened to amazing Cuban musicians. Dave performed at three concerts during the trip and did a great clinic that included a duet with the great Dafnis Prieto! You can read more about the trip and view dozens of photos here! Joe Bergamini recently hosted a one hour webinar with Dave. Joe runs SEN, Sabian's network of more than 2,000 drum instructors. Membership is FREE. Go here to register for SEN and you can watch the full video. Click here to join Dave's affiliate network for teachers! It allows you use Dave's new Online School at little or no cost and it offers come great benefits! The Dave Weckl Online School is NOW OPEN! The Dave Weckl Online School offers a comprehensive and completely updated HD video curriculum for drummers of all levels! It includes lessons on hand and foot technique, ergonomic drum setup, tuning, guest instructors, play alongs, exclusive tour footage (with lessons from the hotel), and a private Facebook group so that you can interact directly with Dave, industry pros, and fellow members of the school! Click here to see all of Dave's news! Dave has created several play along packages that allow drummers to practice to Dave's tunes and record their own versions. They include: the song, a chart, a play along mix, and a video of Dave's actual session! Click here to purchase products recorded with Jay Oliver, Gary Meek, Oz Ezzeldin, Oz Noy and Will Lee, and George Whitty with Ric Fierabracci! Preview Dave's amazing subscription-based learning site! Click here to open Dave's YouTube page! Dave has an amazing live DVD of his acclaimed Acoustic Band performing at Catalina Jazz Club! 11 tunes, including seven original compositions and a full drum solo piece! Click here to learn more and purchase the DVD and album CD! 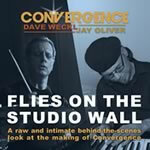 Go behind the scenes with Dave and Jay Oliver as they compose, rehearse, and record their 2014 CD Convergence! You'll see the making of "Higher Ground, " Jay's trip to Ireland, drum solos from each tune, and biographical backgrounds on Dave and Jay. Raw, funny, and very entertaining with more than two hours of footage! Click here to learn more and purchase!